» Kickboxing for Kids: Would Your Kids Fit In? Kickboxing for Kids: Would Your Kids Fit In? If you are just starting to do some research on kickboxing for kids, you may be wondering whether it is a suitable pastime for them to get involved with. After all, isn’t it violent and aggressive? Actually, that’s not the case at all. Instead, kickboxing teaches kids to be disciplined. It also gives them a proper outlet for any aggression or frustration, so they can get rid of it in a safe and responsible way. If you read the papers you cannot fail to have noticed that many young children aren’t as active as they could or should be. Getting your kids involved in kickboxing classes will give them something to look forward to each week. 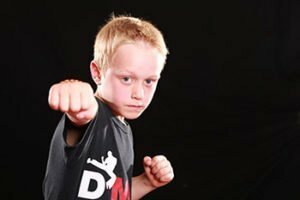 It’s easy to think all the benefits are in the classes themselves, but in reality kickboxing for kids keeps on delivering those benefits throughout the week. Most kids will fit in easily when they attend our kickboxing classes for children. Of course, you’re welcome to come and have a chat with us and to bring your kids so you can see what the classes are really like. We try to instil confidence, respect and focus in every single child who attends our classes. I honestly don’t think there is a child who wouldn’t benefit from or fit in with our classes and enjoy them once they settle in. We like to keep things positive as well. There is nothing better than watching the children who come in for the first time developing their skills and personalities over the weeks they attend our classes. You might be surprised at how much your child changes too – and all for the better. If you have any questions, you know where we are and how to get in touch. We’d love to hear from you.